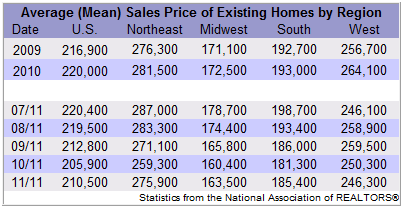 Existing-home sales increased in November and remained above the pace set last year, according to a recent report by the National Association of REALTORS (NAR). Existing-home sales, which include recently purchased single family, townhomes, condominiums, and co-ops were up 4 percent to a seasonally adjusted rate of 4.42 million units expected to sell in 2011. This represents a 12.2 percent increase over the pace set last year at this time. Lawrence Yun, NAR chief economist, sees more buyers taking action. "Sales reached the highest mark in 10 months and are 34 percent above the cyclical low point in mid-2010 – a genuine sustained sales recovery appears to be developing," he said. “We’ve seen healthy gains in contract activity, so it looks like more people are realizing the great opportunity that exists in today’s market for buyers with long-term plans." Total housing inventory fell 5.8 percent in November to 2.58 million existing homes available for sale, representing an 7 month supply of homes at today's current sales pace. Inventories have been gradually shrinking from their record levels of 4.04 million set in July 2007.